← Chickpeas are a food group. Last week I had my parents over for dinner. The thing you should know about me is whenever I have people over for dinner I get very ambitious and make all kinds of weird stuff. Sometimes, stuff I’ve never made before. This has resulted in some delicious and some…interesting meals. OK, so I don’t eat meat. My mom doesn’t like fish and my dad, as I’ve mentioned before, is a “meat and potatoes” kind of guy (except with wasabi. Remind me to tell that story sometime). That left pasta. I happened across this recipe for Asparagus and Spring Onion Risotto and thought – perfect! Pasta, seasonal, and as a bonus my dad actually really likes asparagus. So I bought a baguette and a bottle of white wine at lunch, smuggling them into my office like a criminal, and at 5:00 set off home for my 40 minute commute. Somehow, I figured, I could make 3 things I’d never made before, plus a salad, in my hour and a half window. People, I opened up a bag and threw some olive oil and pomegranate vinegar on it. My mom, being both more adventurous and more tactful, gave her standard line when she knows my dad hates something: “Well, I think it’s good!” I think she meant it but you never know. And in the midst of stirring my risotto continuously I managed to make a pie. Which brings me to the actual subject of my post. 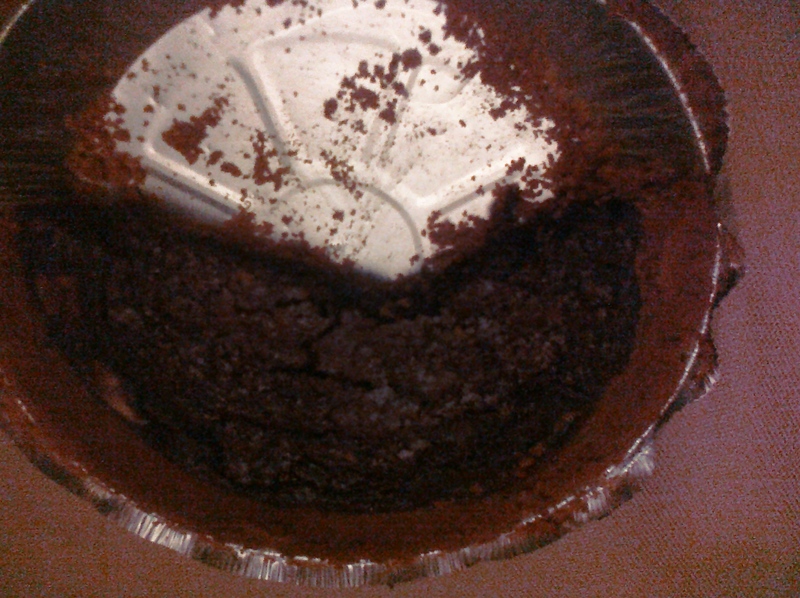 Chocolate Chess Pie. This may be the easiest pie in the world. You melt the chocolate and butter, stir in the sugar and then the eggs, vanilla and a tiny bit of salt, pour it in a crust, stick it in the oven, and you’re done. And no, I did not make the crust myself. What’s wrong with you? I’m not a masochist. You can see that it was awful from the pieces missing. Due to time constraints this one is actually kind of ugly. The sugar isn’t as well mixed in as it could be and there are a few pieces that looked (and tasted, too) a bit eggy. Nonetheless, ‘twas good pie. I foisted this pie on everyone I dealt with for several days. Carpool buddy? Take pie home with you. TV buddy? Here, have pie. I was like your grandma. This culminated in my second attempt of the pie in a week, when I went to visit my dear friends and their new daughter, to whom I’m an honorary aunt. Among all the other food we ate I made them this pie. It was an adventure: I had to make a second batch of filling to fill up the crust, then it was a bit wobbly, and we found out after the fact their oven was only kind of half working. But the pie turned out perfectly. The filling was smoother than the first attempt and it was nice and gooey. I was afraid they wouldn’t let me leave. We all kept telling each other, “Nope, you’re not going to like it, best leave the extra piece.” I did not take a picture of this one. Mostly because I was too busy looking at cute kids and stuffing my face. But trust me. It was better. It was not shared with their other visitors – no one wanted to give up any. The best thing about this pie? When you eat it warm, you think, oh man, this pie is the best warm. Then you eat it cold and you think oh, man, this pie is the best cold! It is just freakin’ good. This entry was posted in Desserts, Pasta, Vegetarian. Bookmark the permalink. 1 Response to try pie. try.